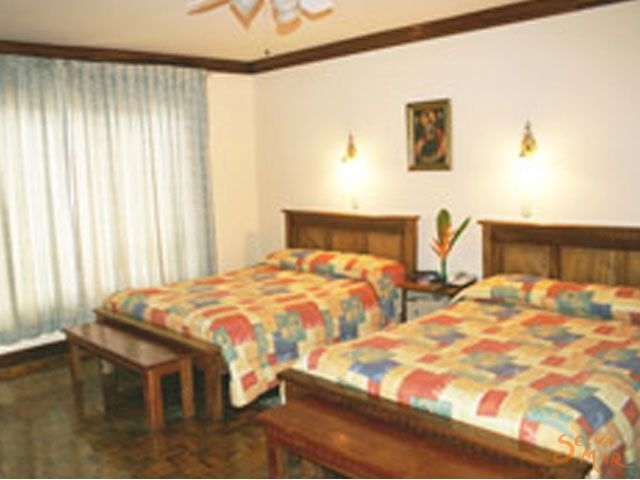 Located in the oldest historical section of San Jose, the " Four Star " Hotel Don Carlos is a small, but significant part of Costa Rica`s rich heritage. Located in the oldest residential section of San Jose, this 'Four Star' Hotel is a small, but significant part of Costa Rica's rich heritage. Once upon a time residence for two past Presidential families, the historical Hotel Don Carlos' warmth and charm, graciously awaits you. Enjoy Costa Rica's finest art works as you stroll through the gallery-like corridors and maze of quiet, garden & fountain settings, restaurant and Jacuzzi. Wander into Anne Marie's Boutique and get lost within this unique world of local artistic creations in Costa Rica's # 1 gift shop. We take much pride in our helpful, friendly and courteous, english speaking service, the distinct individual character found in each of our thirty-three, comfortably appointed rooms, our 'user friendly', on-line Don Carlos Tour Service and our 24 hour security guard service. 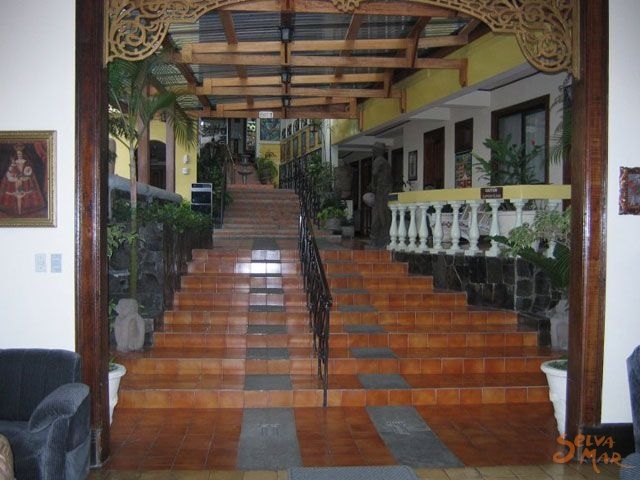 Near the heart of San Jose, Hotel Don Carlos is a fun, quiet and secure place to stay while getting to know Costa Rica. As the most recommended small hotel in the country, come see why our growing numbers of 'return' guests and friends all comment, "Hotel Don Carlos is beyond a doubt, the best hotel in all of San Jose!" The hotel is situated in the perfect part of town. Within minutes walk of the hotel lobby, you'll discover San Jose's Zoo, the 150 year old National Liquor Factory which has been converted into the unusual National Contemporary Art Museum, the pre-Columbian Jade Museum, the National Museum, the Gold Museum, the 1920's "Metal School", built by G. Eiffel-builder of the Eiffel Tower, a variety of interesting and beautiful city parks and of course a wide selection of restaurants, casinos, nightlife and the spirit of San Jose, the hub of Costa Rica. The Hotel Don Carlos is dedicated to serving you and making your Costa Rican holidays a most memorable experience. Come and stay with us, or at least drop by to say hello. Historical Costa Rica and our hotel are one and the same. We are dedicated to helping our guests treasure their visits to Costa Rica by offering comfortable and unique accommodations in a traditional, art-filled setting. A quiet "Oasis" in downtown San Jose, Hotel Don Carlos is the perfect choice for those seeking comfort and security 'near' it all, yet the luxury of privacy, afforded only by being 'away' from it all. Hotel Don Carlos welcomes you to Costa Rica. The history of this beautiful hotel begins with its founder, "Don" Carlos Balser. An internationally acknowledged authority on Pre-Columbian art, author of many books on Costa Rican archeology and fluent in seven languages, "Don" Carlos was active in all aspects of the arts, having painted the frescos of the "Santisima Trinidad" in the dome of the San Jose Metropolitan Cathedral. In 1921, "Don" Carlos came to Costa Rica from Liechtenstein to build and manage the first major hotel in Costa Rica, the "Gran Hotel". In that time in history, the "Banana Boat" was the only transport to Costa Rica and the "Gran Hotel" was the only hotel. "Don" Carlos managed the hotel for many decades until his passion for archaeology absorbed him. Together with his exploratory partner, Doris Zemurray Stone, they opened many unexplored archeological sites all around Costa Rica. Due to the particular architectural configuration of our Hotel, located amidst the historical neighborhood of Barrio Amón, in Downtown San Jose, all of our rooms are different one from another. There are not two rooms that look exactly the same. Includes: Continental breakfast, complimentary drink, free internet 24 hours a day, wireless internet connection, free local telephone calls, one free international call, free parking. It’s the classic spacious room, elegantly furnished and decorated, with one or two beds, cable TV, telephone, private bathroom with hot water, safe deposit box, hair dryer, executive desk. Is our exclusive, luxurious, spacious and distinguished rooms, well decorated in order to cherish you with the comfort you deserve. Available with king size bed or two double beds, executive desk, cable TV, safe deposit box, telephone, private bathroom with hot water and hair dryer. Two double rooms specially designed for families who like to have a bigger and more comfortable space and privacy, separated by a bath room which is shared by both rooms. One room has a double bed and a sofa bed and the other has two single beds, cable TV in each room, shared telephone and safe deposit box, shared bathroom with hot water and hair dryer.